It's official guys here we have the iPhone 5! 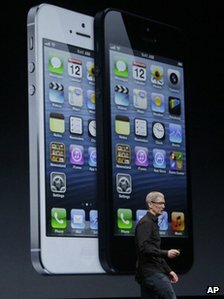 The phone is a slight redesign and to directly quote the Apple guys the, "iPhone 5. It is made entirely of glass and aluminum. It's designed and built to an exacting level of standard unlike anything we, or anyone in our industry, have made before." Improvements to the aesthetic include slimming the whole thing down to 7.6mm thick, which is 18% thinner than before, it's 112 grams which is 20% lighter than the 4S!! The company assures us that this won't affect one handed use; "For the first time ever we've increased the size of the display. By making the screen taller, but not wider, you can still comfortably use it with one hand." This time we have another Retina display, at 326 ppi, but the new resolution is1136 x 640 resolution, because the screen is slightly larger at 4 inches. The whole thing is the same width but a bit taller with a new 16:9 aspect ratio. 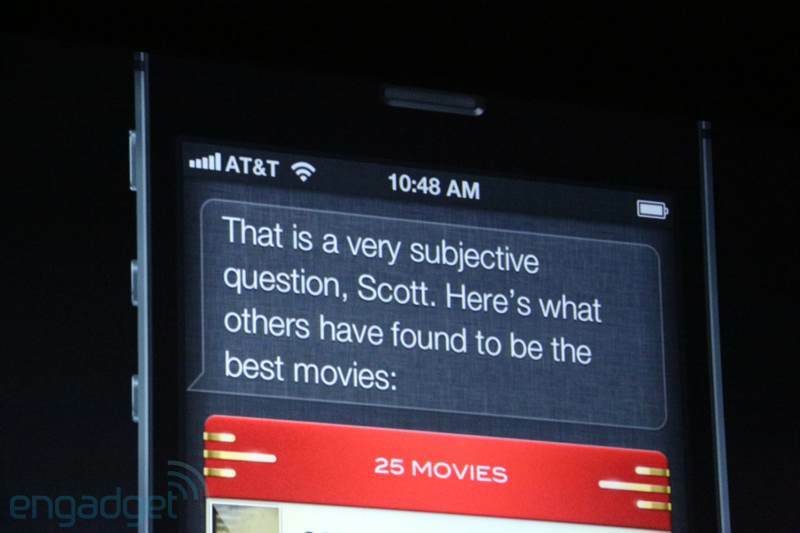 The enlarged screen has allowed Apple to cram in five rows of icons, on top of the four shortcuts on the bottom. And yes we have LTE(!!!) as well as GPRS, EDGE, EV-DO, HSPA, HSPA+, DC-HSDPA. HSPA+ is 21Mbps, DC-HSDPA is 42Mbps, and LTE is a max of 100. Canada: Rogers, Telus, Bell, Fido, Virgin. In the UK it'll be on O2, Three and Everything Everywhere! It's likely Vodafone and the other networks will have it too but we haven't heard officially yet! The rest of the continent has a convenient little map, right. There's no word on specific battery capacity but it's rated for standby 225hrs, 8 hours lte, 40 hours music and 10 hours wi-fi. It's an 8-megapixel 'iSight' camera, capable of producing shots up to 3,264 x 2,448p resolutions, The sensor is backside-illuminated, with a five-element lens and f/2.4 aperture. Same as the iPhone 4S but thinner.5-element lens and f/2.4 aperture. 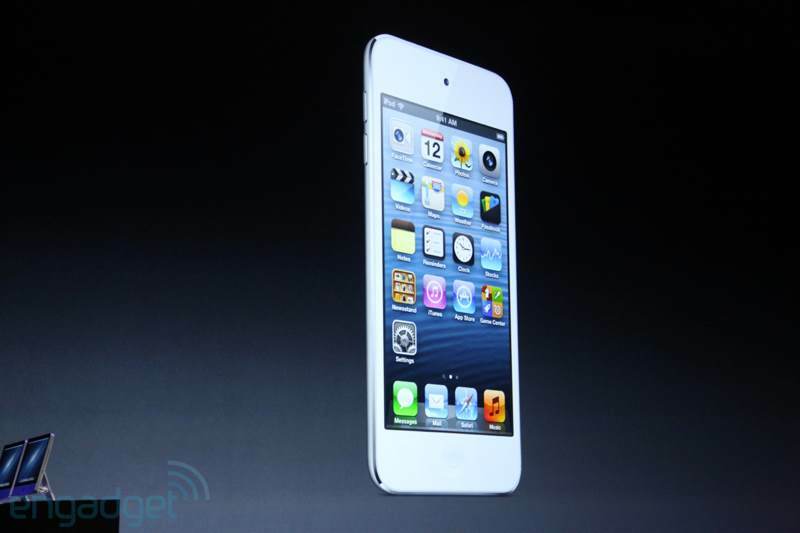 Same as the iPhone 4S but thinner. dynamic low light mode. It evaluates nearby pixels to give up to 2 f-stops greater low-light performance. 40% faster than the 4S. Finally they have an official panorama mode!It's a 28 megapixel resulting image! It's 1080p still but with better video stabilization, and there's facial recognition. You can grab photos, too, still.The front-facing camera is now 720p, backside illuminated. Facetime over cellular but they didn't specify which or any networks which would do it! The audio system - there are three microphones. Front, bottom, and back for better voice recognition and noise cancellation. Many things can be done wirelessly...Bluetooth for audio, WiFi for AirPlay or syncing to iTunes, "and best of all with iCloud we can download all our content wirelessly." No word on adaptor pricing, but big name brands such as Bose are already working on new speakers! iPhone 4S, iPhone 4, 3GS, new iPad, iPad 2 and iPod touch all are getting iOS 6 and it'll be available, before the new iPhone, on September 19th! Here we've got the Integrated maps we saw at WWDC! Passbook for all of your tickets and bank details and everything else! Safari enhancements so that it's more of a desktop experience. Siri updates: Ask about a sports result; "how did Man Utd do last weekend?" it'll give you the score.You can also now post statuses to Facebook or Twitter via Siri! The phone will be available in two colours; black and white again folks! 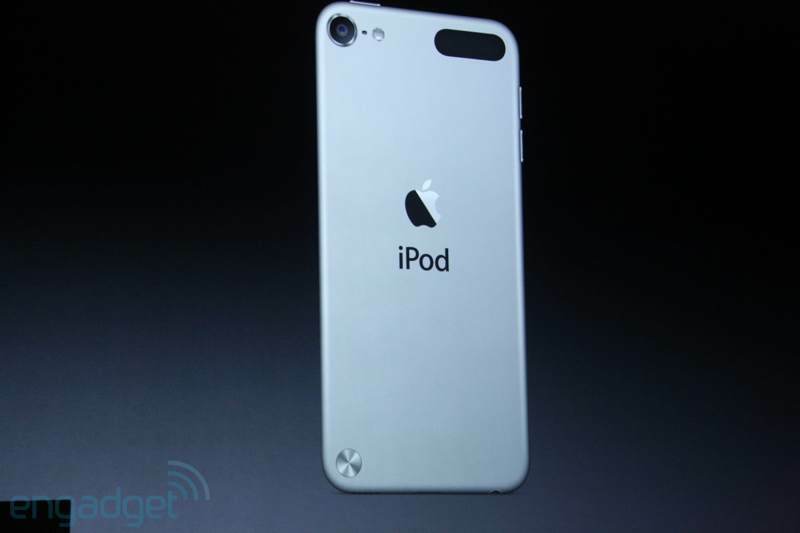 The white version has a raw aluminum back. The black one has the black anodized backing. 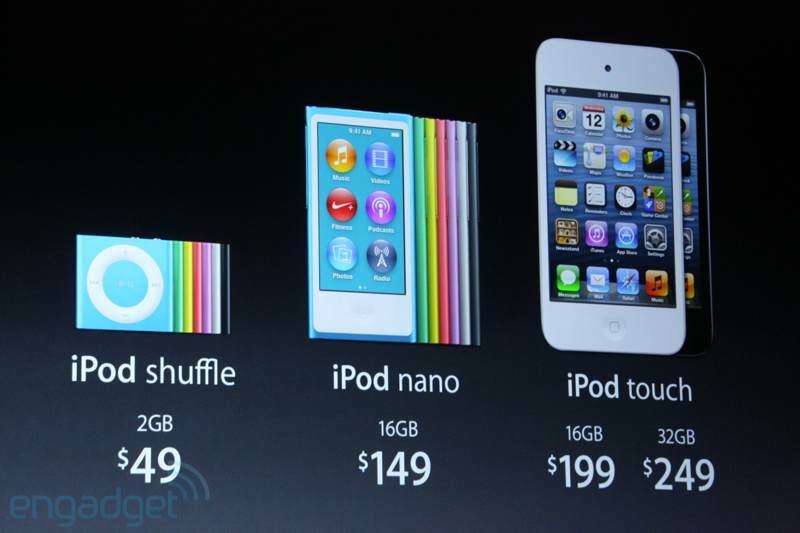 And pricing, it's the same as the 4S currently is so for those of you in the US that's $199 for 16GB. $299 for 32GB, $399 for 64GB. 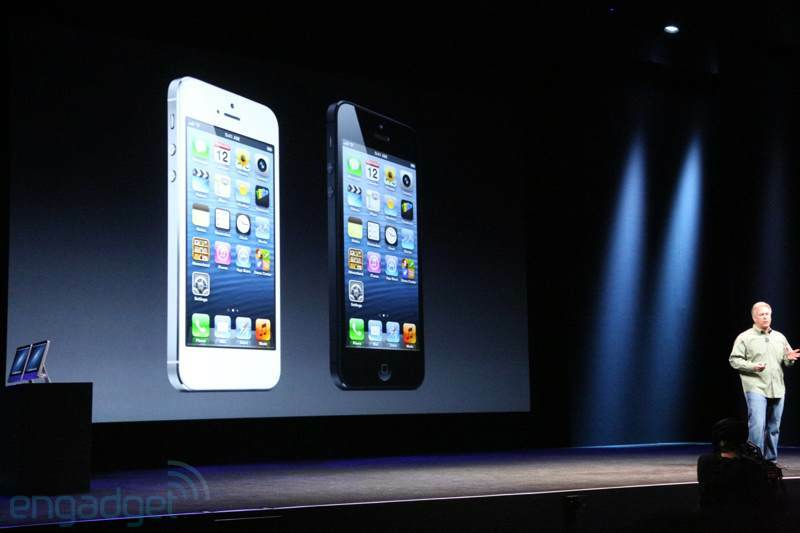 Which means that the iPhone 4 is now free on contract and the 4S is now $99. Something which Apple says presents the 'best option' in every price bracket. Pre-orders start on Friday the 14th. Shipping on September 21st in the US, Canada, UK, Germany, France, Australia, Japan, Hong Kong and Singapore.20 more countries next month. "This will be our fastest phone roll-out ever." Bigger screen (subjective of course). 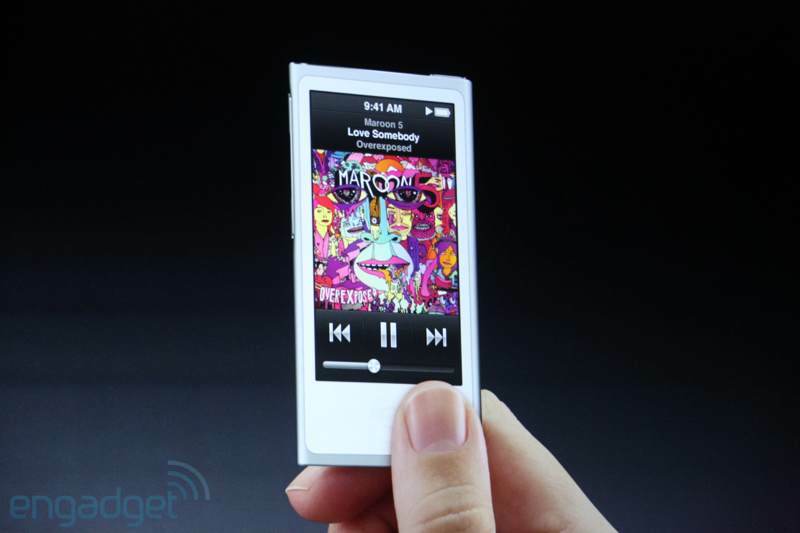 Apple said that with the new Nano they "wanted to give it a really large display. We want to have really easy to use controls. We want to make it thin and light... and of course we'd want to give it the latest technologies like Lightning." 2.5-inch display in the nano that's multitouch. It's super tiny but has a wider screen than before. Looks to have a tiny Home button. It's 5.4mm, 38% thinner than the last Nano! There's an FM tuner with DVR functionality -- pausing and rewinding. Ohh and there's Bluetooth too! 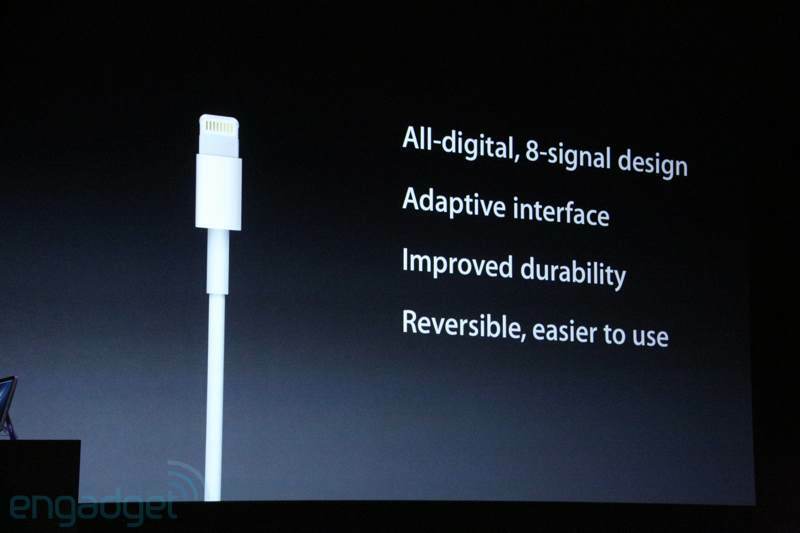 Just 6.1mm thick, 88 grams in weight and a slightly redesigned, more squared back. A5 processor for better gaming! Five megapixel iSight camera. Backside illuminated, f/2.4, five element lens and that same sapphire crystal lens cover. 1080p video with image stabilization and the ability to use iMovie right away! 720p front camera for FaceTime. Up to 40 hours of music playback in the touch, 8 hours of video. Slightly increased over the 4th gen Touch. There are reportedly 700,000 apps in the App Store now! The iPad is responsible for 91% of tablet web traffic. 60% of tablets sales were from the iPad! 27% US Market share in PC sector. iTunes has had a serious facelift! Essentially they've tried to make everything easier to use! And there's a little pop-up mini player for iTunes! 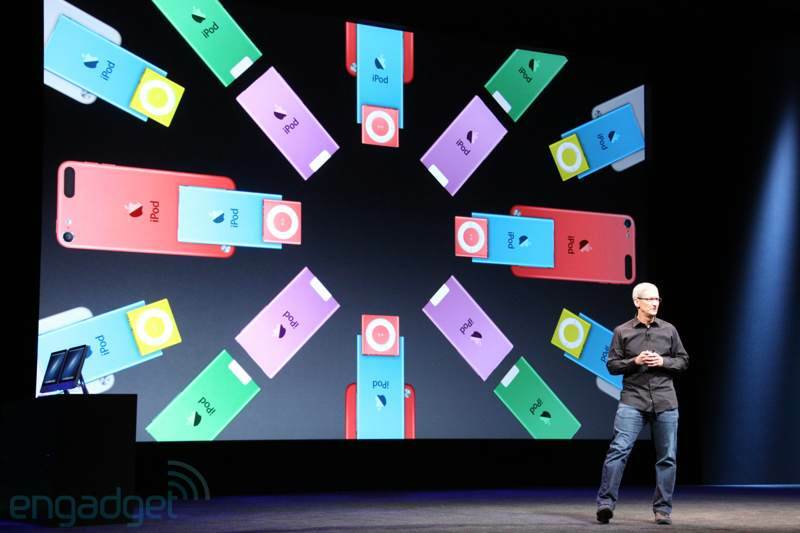 But, "The new iTunes will be available in late October" so not until iOS 6 has landed. 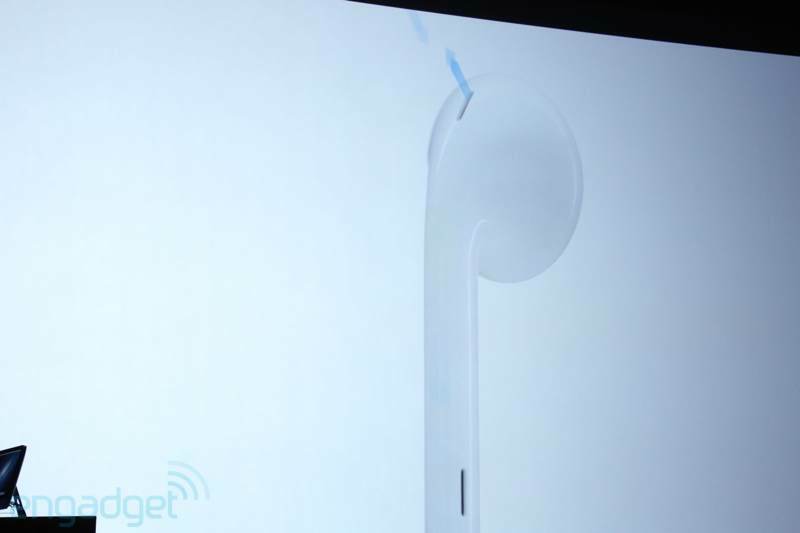 And finally, there's new earbuds!